On a Monday evening in May 2011, under cover of darkness and with protection from police barricades, builders dismantled the 22 metre-high Lenin statue in the centre of Khojand, Tajikistan’s second city in the north of the country. The anecdote popular among locals is that Lenin welcomed the opportunity to relocate as, from his vantage point overlooking the city’s football stadium, he had grown bored of watching the local football team continually lose. The tallest statue of Lenin in the world now stands on a piece of scrubland on the outskirts of town with a view of rundown Soviet-era tower blocks, dilapidated factories and cows grazing at the base of his crumbling plinth – not a spectacle that panders to the Communist ideology. Yet the local government, as part of a national directive, was interested in a different discourse which would emerge from the removal of Lenin and his replacement with the ninth century ruler of the Samanid dynasty and the supposed father of the Tajik nation, Ismail Somoni. Monument to Ismail Somoni , ninth century ruler of the Samanid dynasty, in Tajikistan's second city and financial capital, Khojand. In an attempt to develop a new national identity, post- Soviet republics of Central Asia usually highlight symbols rooted in the distant past. 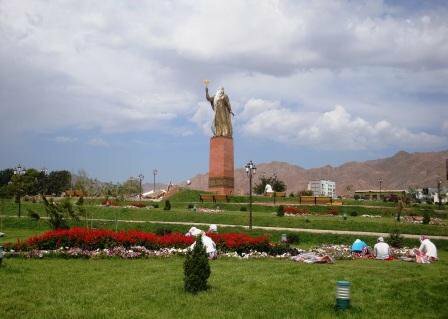 The even taller statue that stands on Lenin’s former plinth represents the national narrative that the Tajikistani government is embracing in their attempt to engender a sense of national identity for the inhabitants of Tajikistan, a country fragmented along ethnic, regional and religious lines. (‘Tajikistani’ refers to the inhabitants of Tajikistan and ‘Tajik’ to the ethnic group). In 1991 frenzied crowds toppled the statue of Lenin in the capital, Dushanbe, but the outbreak of civil war in 1992 stalled progression. Peacekeeping and stabilisation took precedence over establishing legitimacy for the existence of a country, which the Soviets founded as a constituent republic in 1929 but had never existed as an independent state. Often the government of a country which has undergone social and political change chooses to rewrite the country’s history, highlighting elements favourable to current and future policies. Yet, in contrast with other countries which found independence with the collapse of the Soviet Union, the five-year civil war and continued political instability meant that the building of a Tajikistani national narrative has been tentative. The rewriting of history and the construction of a historical myth assert Tajikistan’s presence as an independent state with a unique history, rather than just a sovereignty of Soviet conception. 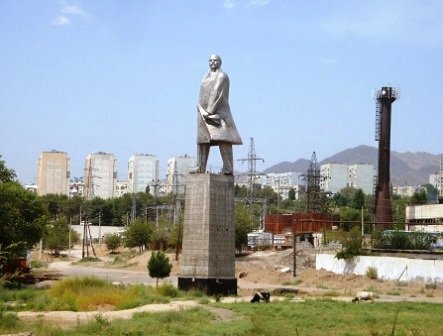 In neighbouring Uzbekistan, soon after perestroika, President Islam Karimov ordered the removal of all the Lenin statues that littered the country’s urban landscape. The purging of statues of the Soviet leader not only eliminated constant reminders of the Soviet past, but also facilitated the government’s progression towards a new historical focus for the nation: the narrative associated with the Turco-Mongolian ruler Amir Timur. Born on Uzbekistani soil, the founder of the Timurid dynasty, Timur, conquered Persia, Northern India and Syria and established the now Uzbek city, Samarkand, as the capital of his empire. He is more commonly known in the West as Tamerlane or Tamburlaine, deriving from the Turkic epithet ‘Timur the lame’, referring to his battle injuries rather than his capabilities. Thus the monuments to the fourteenth-century conqueror, which sprung up across Uzbekistan in the early 1990s, were associated with an attempt to appropriate a history for the country which went back further than its inception as a Soviet republic in the 1920s. As the nucleus of the national narrative, references to Somoni in Tajikistan are hard to avoid. Over the past fifteen years, it has been becoming more prominent in the public arena: for example you could fly to Somoni Peak (renamed from Communism Peak in 1998) on Somon Air (established in 2008) and pay with somoni (the currency replaced the ruble in 2000). The Tajikistani President, Emomaili Rakhmon commented ‘we must regard the history of our nation like a pure and holy mirror.’ He is presumably eager to emulate the celebrated features of Somoni, who presided over a dynasty renowned for strong leadership, triumphs in the sciences and arts and for opening a new trade route which absorbed business from the Silk Route. The rewriting of history and the construction of a historical myth assert Tajikistan’s presence as an independent state with a unique history, rather than just a sovereignty of Soviet conception. The recent removals of Soviet figurehead statues in Tajikistan and their replacement with Somoni and a select few other Persian cultural figures are the latest indication of government emphasis on eradicating the Soviet past by emphasising the narrative of Somoni. The renewed momentum came ahead of twentieth anniversary celebrations of Tajikistan’s independence in 2011 and in anticipation of the presidential elections later this year. The rulers of Central Asian post-Soviet states do not like constitutions which limit their time in power. Emomaili Rakhmon, president of Tajikistan, is no exception. 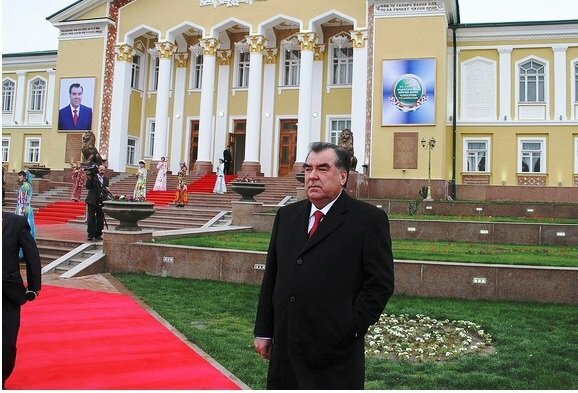 He has been the head of state for more than 20 years (photo: Tajikistan president’s press service). In the build up to the 2006 elections, the government declared a year of celebrations to mark the fifteenth anniversary of independence and the 2700th anniversary of the Year of Aryan Civilisation. The joint celebrations of Tajikistan’s independence and the ancient inhabitants of the same territory provided a rallying point to unite the population in celebration of its past in an election year. Rakhmon went on to receive 79% of votes. In the current climate, analysts do not foresee Rakhmon losing power in the 2013 elections after twenty one years as head of state. Nonetheless the state is weary of the opposition voice, all too evident when at the end of 2012 a staggering 131 websites of Tajikistani, Russian and European origin were blocked in one fell swoop. Popular dissatisfaction with increasing poverty and poor social conditions make the state fearful of the risk of contagion from the surrounding region, namely from the north with Kyrgyzstan’s 2005 Tulip Revolution, China’s troubled Xinjiang province to the east, continuing instability to the south in Afghanistan and the international shake-up/stir following the Arab Spring. The French political scientist, Olivier Roy, demonstrates that Tajikistan is ostensibly divided according to ethnic and religious groups, yet the real allegiances of the people lie with local community networks. The influences of these regional sub-loyalties are less predictable and more difficult to manipulate from the national level. Moreover, the Tajikistani government attributes the increased internal instability to rifts in the Islamic population, more specifically to the growth of Islamic extremism. The country is predominately home to Sunni Muslims, President Rakhmon included in this number, with a growing Shi’a Muslim population. The validity of the Islamic threat is questionable as little more than hysteria on the part of a government keen to delegitimise the nearest political rivals, even if they have little chance of achieving power. The greatest threat to Rakhmon’s leadership, however, is the Islamic Renaissance Party, which has been tarred with the label of extremism. Since 11 September, the Tajik government has manipulated global anti-Islamic sentiment in order to further invalidate the Islamic voice in the eyes of the public. 2011 witnessed Tajikistan’s first suicide bombing which the government attributed to Muslim extremists. Predating Islamic presence in the region, the historical narrative of Somoni unsettles historical justification for the existence of Islam in Tajikistan. The Lenin in Khojand was taken down without prior public consultation, at night when few people were on the streets, and consequently only a few dozen people gathered to watch the dismantling process. The authorities had successfully avoided public demonstrations, which could have sparked greater unrest, considering the divergent population and extensive political, social and economic grievances in the region. That said, the removal of the Lenin was not accepted as if the local authorities had just been rearranging the city’s street furniture. In Parliament, the Communist Party accused the government of discrediting and snubbing a large chunk of the country’s cultural history. Public reaction, however, has been mixed, as evidenced by the heated debates which ensued in the national blogosphere. On the one hand bloggers question why the country is being encouraged to erase from its memory a system which brought the country into existence and facilitated the social benefits and industrial investments associated with being a Soviet republic. On the other, people are only too pleased for the destruction of statues which act as reminders of the pain and suffering of life under rule from Moscow. Discusssing the statues, one well-known blogger claimed there was little difference between the brutalities inflicted by Lenin and Hitler. By relocating the Lenin statues, as in Khojand, or removing them completely as in other parts of the country, the government is encouraging the population to partake in ‘collective amnesia’, a term coined by Benedict Anderson in his celebrated book Imagined Communities. The Soviet narrative accounts for two-thirds of Tajikistan’s existence and is still part of the population’s active memory, so the success of collective forgetting this narrative is questionable. Somoni lacks relevance to the population that was educated under the Soviets: even if children are now growing up being taught about the country’s early history in the classrooms, they play under the bust of Grandfather Lenin still found in most school grounds. Despite the flaws inherent in being a Soviet republic, many in the country yearn for the financial and social advantages they remember under that system. After the dissolution of the USSR, independence brought Tajikistanis a decade wracked by civil war and social unrest, followed by an era of high unemployment, decreasing literacy levels and a ranking among the twenty countries worst hit by escalating food prices in 2011. There was hardly a town or village in the old USSR without a monument to Vladimir Lenin. 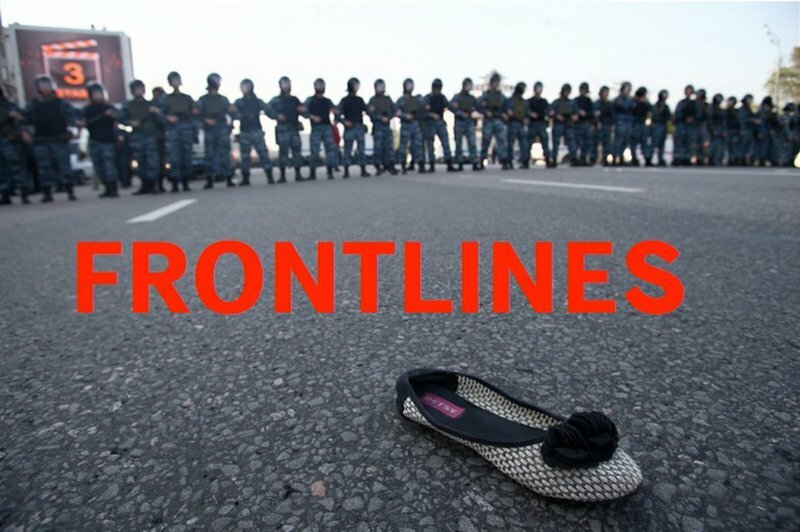 They have suffered different fates in various post-Soviet republics. Some used old Lenins for scrap metal, but in Khojand the monument was moved to a new, rather more decrepit location. The Soviet myth is kept alive through the close connection Tajikistan has retained with its former hegemony. In the past five years the country has attracted interest from the world’s major powers, highlighted by Hillary Clinton’s 2011 announcement of the creation of a ‘New Silk Road.’ Tajikistan is in the enviable position of being a participant in the game of playing Russia against China, as both countries are keen to establish Central Asian trading partners. Yet the country is not in a position to remove the crutch of Mother Russia, still considered as a vital source of finance by Tajikistanis. Tajikistan’s high unemployment is most noticeable in Russia where there are currently 600,000 Tajikistani migrant workers – the unofficial figure is purported to be much higher. Eighteen months ago, the directions I had been given to my accommodation in the small northern city of Istaravshan related to the Lenin statue which stood on the corner of the main bazaar. Unfortunately for me, the locals I stopped for help could not recall the statue which had been removed little more than a week prior to my arrival. Yet, once I eventually found my destination, I ventured 50 metres inside the market to find the USSR Café. In a Tajikistani backwater, I discovered an establishment filled with Soviet kitsch, Stalin quotes and Lenin paraphernalia, catering not for tourists, but the local market-goers, daydreaming of a more prosperous era for the country as they eat their Central Asian staples of plov and shashlik. The Tajikistani government is trying to institute a fabricated narrative of an ancient population to carpet over the issues which threaten national security. A referendum reverted the city of Leninabad to its pre-Soviet name, Khojand, in 1991; the region in which it is located was Leninabad until 2000 when it was renamed Sughd; the statue of the eponymous Soviet leader was surreptitiously removed in 2011; yet the main street continues to bear the name of the founder of the Soviet state. Even if the Somoni construct holds for the presidential elections later this year, the fractured population remembers the prosperous, stable and developing country characterised by Soviet rule.